Intimate dining with a focus on local, freshly-caught seafood from Kvarner Bay. Restaurant Sveti Jakov’s menu is focused on good and simple Mediterranean cuisine with a commitment using local and sustainable foods. We host business lunches, social meetings and romantic dinners, as well as private parties, small wedding dinners and celebrations. 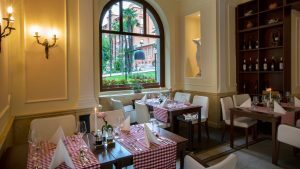 Under the grand arcades, crossing from the old to the new, Restaurant Sveti Jakov is set in a historic building in a serene location that provides a truly modern-day dining experience. Our menu is focused on good and simple Mediterranean cuisine, such as grilled fresh fish and steak, fish soup and homemade pasta, with a commitment using local and sustainable foods. Specialities include daily fresh fish from the Kvarner Bay and the highly recommended lobster and Mediterranean scallops. More than 100 white or red wines, both domestic and global, are available by the bottle or by the glass. 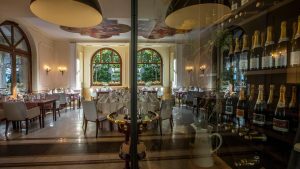 Restaurant Sveti Jakov is an intimate venue for hosting business or social lunches, as well as private parties, small wedding dinners and celebrations.